Fleas are a common pet pest that often require a flea service treatment by licensed pest professionals. These blood feeding ectoparasites require blood meals from the hosts that they infect. Not only do fleas cause discomfort such as pain and itching by biting, but they also can spread diseases and pathogens. Fleas can infest a residence when they fall off your furry four-legged pets and onto fabric bedding, furniture, carpet and reproduce quickly. However, it is also possible to acquire a flea infestation without animals in the home. This could be a sign of potential rodent problem or stray cats and birds could be transferring fleas into your yard. The expert jumping skills and hitchhiking abilities of fleas allow them to transport themselves effortlessly and move easily once they invade a residence. Most fleas infest mammals and some fleas infest birds.The most important flea to people in Southwest Riverside County are cat and dog fleas. Cat and dog fleas are host fleas, spending their entire adult life on their host, compared to nest fleas which primarily infest rodents and birds. Flea bites can cause pain and irritation since they feed on blood with tube-like mouth parts. The most common flea found in Southwest Riverside County is the cat flea, which infests both cat, dogs and humans. The dog flea is rarely found in North America. The oriental rat flea is of historical significance and is the main vector of the highly virulent bubonic plague or “black death”. Dog and cat fleas can transmit other pathogens such as tapeworm. Flea saliva can cause skin allergies in pets and humans. A flea’s life cycle begins when the female lays eggs after feeding. Fleas can lay up to 50 eggs a day, releasing an egg per hour, making areas where the host sleeps one of the primary habitats of eggs and developing fleas. Flea eggs are impervious to pesticides and treatments against them and hatch 2-14 days after being laid. Normal flea populations consist of 50% eggs, 35% larvae, 10% pupae and 5% adults. 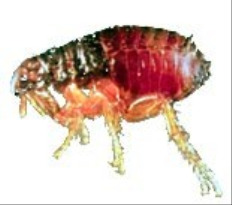 Fleas are able to detect movement, pressure, heat, noise, or carbon dioxide in order to find a host. AmeriGuard’s Flea Defense Service begins with a licensed technician providing a full inspection of your home. During the inspection, your technician will identify all flea problem areas as well as potential flea harborages. Fleas are often located under porches and decks as well as pet bedding, shoes, pant legs or blankets. For your protection, AmeriGuard requires all flea services to comply with our Flea Control and Preparation Checklist before the flea treatment can begin. We recommend vacuuming thoroughly and disposing of your vacuum bag, picking up all toys and objects on the floors and moving all furniture away from the walls. Upon arrival, your flea technician will verify completion of the preparation checklist. Failure to complete the steps listed in the preparation checklist may delay treatment and potentially void any guarantees on our flea service. AmeriGuard Pest Defense treats for fleas using specially formulated, low toxicity chemicals and insect growth regulators. This one-two combination eliminates both active adult fleas and prevents larval forms of fleas from reaching maturity. During your flea treatment, we ask that all pets be removed from the premises. In addition, we ask that all pets be on flea control medication or have flea treatments performed at the time of service. Without eliminating fleas where they start, your pets will continue to re-infest your home. Two weeks after your initial treatment, your technician will return for a follow-up flea service. During the follow up, your technician will inspect your problem areas for signs of remaining fleas and throughly re-treat any flea problem areas. Are you battling a flea problem or have just begun to see emerging signs of a flea infestation? Prolonging flea treatment will only lead to more flea eggs and a worsening flea problem. For every adult flea, there may be hundreds of flea eggs waiting to hatch. Infestation pop up quickly and are harder to control as time passes. Call your local and licensed flea service professionals at AmeriGuard Pest Defense (951) 652-0505 or complete an online request form. We will contact you within 24 hours of receipt of your request.